note: the Google Maps imagery was obtained before this light was constructed. The light itself does not therefore appear in the map but the arrow marks its position. 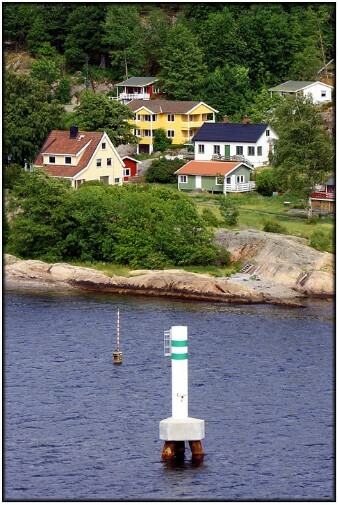 This is one of the lights built during the 2007/2008 construction programme in Drøbak Sound. This one caused me more confusion that any of the others because, given the age of most of the lighthouses I have seen in my travels around Britain and elsewhere in the world, I at first assumed that the complete absence of a lantern meant that it had been removed. I even toyed briefly with the notion that the missing lantern could have been the one in the grounds of the Norwegian Maritime Museum. My next theory was that the tower served simply as a daymark and that it had never had a lantern. That second theory had some truth in it but it didn't occur to me that the reason the tower had never had a lantern was simply that the lantern had still to be fitted. However, that turned to be the case and the light is now active, it's characteristics, as shown above, having been obtained from the Norsk Fyrliste. 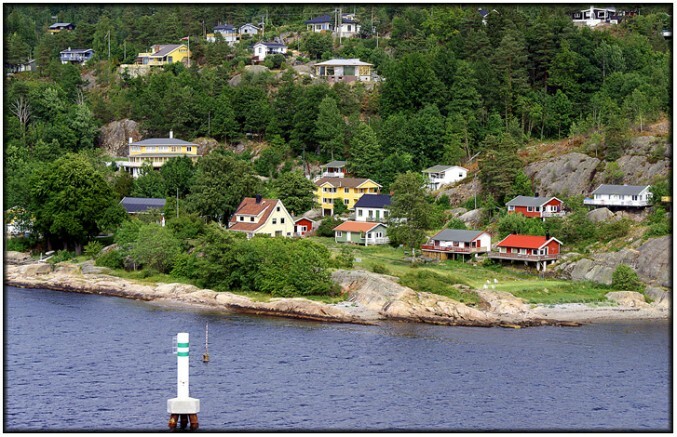 The landscape shot below shows the tower in the foreground with some of the picturesque houses on the Akersus County shore of the fjord in the background.